DETROIT May 15, 2012 -- Thom Connors, SMG regional vice president and general manager of Cobo Center announced today the onset of construction for the new "signature space" for Cobo Center. Well into stage one of Phase III of the 5-year renovation, spacious three-story glass atrium that links the main floor of the venue with a new entrance facing the Detroit River, is scheduled for completion in January of 2013, in time for the North American International Auto Show (NAIAS). 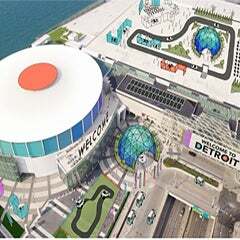 When completed, the atrium area will bring the lower-level exhibition space more naturally into the facility and link Cobo Center more fully to Detroit's scenic riverfront. "Today's the day when the caterpillar officially enters its cocoon and begins its transformation into a butterfly," said Detroit Regional Convention Facility Authority (DRCFA) board chair Larry Alexander. "When complete, this area will be the most visually dramatic and breathtaking manifestation of physical change to the facility." Internal demolition on the former Cobo Arena is complete, and new glass exterior, a 40,000 square-foot ballroom and 25,000 square-feet of meeting space will take its place, scheduled to come online in May of 2013. Construction has not interrupted Cobo Center operations, which was assumed by SMG in October of 2010, when the DRCFA hired the company to manage operations at Cobo Center. Thom Connors, regional vice president and 37 year veteran with SMG came aboard as general manager to improve customer service, change the corporate culture and stabilize operational finances. 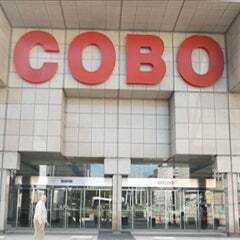 The first year track record of Cobo Center’s new management team: in January 2011 the NAIAS announced an agreement with SMG for a five-year deal to keep the auto show in Cobo, expected to pump an estimated $1.75-billion into the Metro Detroit community. Later that month, the state of Michigan awarded Cobo Center a Green Venues Michigan certification. The Detroit Shoppe featuring made-in-Michigan and Detroit sports team merchandise opened on the concourse, with all proceeds going to local area charities. And the number of events and visitors to Cobo Center doubled from FY 2011 – 2012, while operating expense was reduced by $1.3-million due to reduction in energy usage. “It’s professional management, it’s better service, it’s better sales, so we’ve increased the level of activity,” said Patrick Bero, CEO and chief financial officer of the DRCFA. Summer bookings have doubled for 2012 v. 2011. The return of the corporate market segment for Cobo Center includes events such as Novonordis, BASF, and Care Fusion. First time public shows will be coming back: Youmacon, Detroit Bike Expo as well as a new Golf Show. New bookings in the government sector include the National Veterans Administration Small Business Conference and Expo that will include a huge job fair for veterans and is their largest annual event. Also included is the American Federation of Teachers Biennial Conference in June. Summer sporting events including Schneider Publications TEAMS Conference and Expo, and the 2012 Acrobatic Gymnastics National Championship. With all the new bookings, the number of visitors to Cobo Center during the summer is expected to rise 250 percent. Connors credits much of the recent success in Cobo Center operations to staff restructuring: facility operations placed under Cobo’s assistant general manager Claude Molinari, a 15-year veteran of SMG and former general manager of SMG’s SMGX Exhibition Services company; turning the previous sales staff of one member into a team of four; recruiting new event managers; creating a new finance team; adding a marketing and communications position for website development, public and media relations development, and customer relations. Progress from these advances is evidenced by recent customer survey results giving Cobo an overall facility rating of 97.6%, or excellent, in the first quarter of 2012. “I think that’s now become the new standard and we’re challenged to maintain it throughout the construction,” said Connors. “All three stages of Phase III of the Cobo Center renovation will be completed for our upcoming ASAE Annual Meeting & Exposition in the summer of 2015. In the meantime, we have all exhibit space available and full use of meeting rooms up to current capacity,” he adds.